After two weeks travelling along the Karakorum Highway, arriving in Lahore in late June can be quite a shock. With bustling streets, noisy traffic and pre-monsoon temperatures in the mid-40s, life in the city stands in stark contrast with that found along the cool mountain roads winding north towards the Chinese border. Posters stuck on telegraph poles opposite my hotel announced the Pakistan International Squash Circuit-II tournament being held at the city’s Punjab Squash Complex. 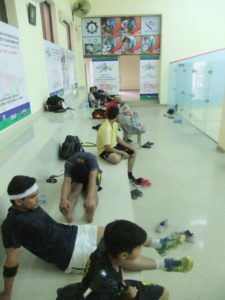 Unfortunately, I’d missed the finals by one day but decided to visit the venue on Lower Mall Road where all three recently-renovated courts were in use. There, I met Khurram Shehzad whose coaching pedigree extends to Dubai and Malaysia. 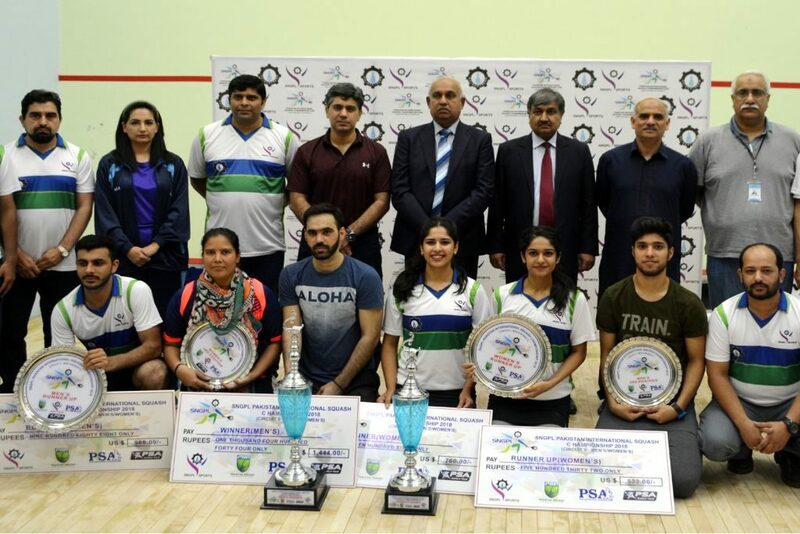 Compared to the glory days of Gogi Alauddin, Hiddy Jahan, Qamar Zaman and the Khans, Pakistan’s international squash presence is now relatively low key. Its two highest ranked male players, Asim Khan and Tayyab Aslam (both from Lahore), currently occupy positions 88 and 95 respectively in the PSA world rankings. In the women’s rankings, Sialkot-born Faiza Zafar, currently resident in Lahore, is the country’s highest ranked player at 99. Both Aslam and Zafar featured in the Circuit-II finals, Aslam going down 3-2 to Peshawar’s Farhan Mehboob and Zafar 3-0 to her younger sister Madina. But it’s the restricted access to visas, said Shehzad, that, together with limited funding, continues to limit the opportunities for home-grown players to develop through international competition. In a recent exception Mehboob, Aslam, the Zafar sisters and Peshawar’s Farhan Zaman all featured in the 2018 Commonwealth Games, held on Australia’s Sunshine Coast. Aslam and Zaman reached the last 16 of the men’s doubles with Aslam also reaching the last 16 of the mixed doubles with Madina Zafar. 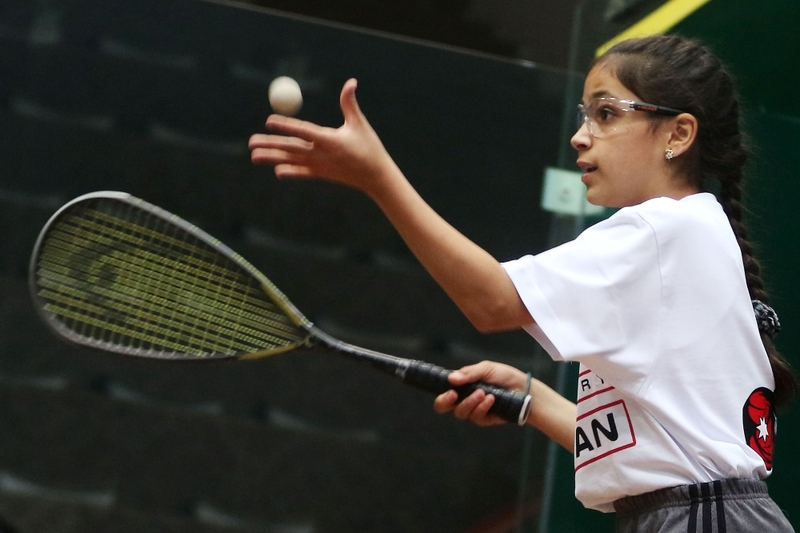 Zafar also reached the women’s singles plate semi-final, losing to the eventual winner, Barbados’s Meagan Best. The day after my visit was the last I spent in Pakistan. It was also the first day of the monsoon. Thanks to The Nation, the Khilari sports website, the Squash Info website and, as always, Wikipedia. A lot of water has flowed under the proverbial since I last wrote about the end of year World Series Finals. At that time (January 2011) the finals had the unique distinction of being held in a (temporary) inflatable venue in the grounds of The Queen’s Club in London, a location best known as the home of a grass court tennis tournament held a fortnight before Wimbledon. The Finals that year were also unique in a different way in that they terminated, unexpectedly, at the semi-final stage. This was due to the unfortunate manifestation of gale-force winds over and, sadly, through the tournament venue causing it irreparable damage. As I remember, the colour schemes for both the show-court and the night-time illumination of the outside of the bubble-shaped venue both incorporated pink. For this year’s tournament (held in Dubai in June) I’m glad to see that the former colour scheme, at least, has been retained. However, with regard to the outside of the venue (the state of the art Dubai Opera), I suspect that pink may have proved to be a step too far. Thanks to PSA Squash TV. Although the game of squash was invented in Britain, the first squash governing body in the world was founded, in 1904, in the United States. 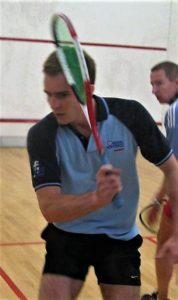 In fact, it was not until 1928 that an equivalent organisation, the Squash Racquets Association (SRA), was formed to agree standards for the game in Britain, including those for court size. By that time, however, many squash courts had already been constructed which did not meet the new standard. Two of them were built in London during the period 1919 – 1921 to the same specification as the squash court on The Titanic which had sunk in 1912. The courts, known as The Claridge Courts, formed part of the premises of a service club in London’s Piccadilly. They were to remain in use for almost a hundred years. The Claridge Courts were seventeen inches narrower than the 1928 SRA standard. During their post-1928 lifetime, this feature was to add what has been described as “a certain measure of eccentricity” to the games played on them. The courts were located on the premises of the RAF Club, established in late 1918 for the use of members of the Royal Air Force. The RAF itself had been founded only on April 1st of the same year and was the first such national force in the world to become independent of army or navy control. The RAF Club’s buildings, still in use today, were acquired by the middle of 1919, their Piccadilly frontage being originally that of the Ladies Lyceum Club. The RAF Club was officially opened by HRH The Duke of York in February 1922 and was visited the following month by Their Majesties King George V and Queen Mary. This association with the Royal Family continues to this day, Her Majesty Queen Elizabeth II being the Club’s Patron. The Claridge Courts were amongst the first in London to host matches in the Bath Cup, the oldest squash league in the world. Established in 1922, the Cup was named after its founders, the Bath & Racquets Club, and is still one of the most prestigious squash competitions in Britain. The Cup is contested annually by the oldest clubs in London including: Queens, RAC, Hurlingham, Lansdowne, Roehampton, Oxford & Cambridge, MCC, Cumberland and Lloyd’s of London. The RAF Club has been represented in the competition since its inception, pausing temporarily in the early 1940s whilst its players were otherwise occupied in the Second World War. Over the years the Claridge Courts have also been used for internal competition between Club members and their guests, as well as for inter-service competition with representatives of Britain’s other armed forces. The Club also has a long tradition of friendly competition with other London-based clubs such as Jesters, Escorts, Swans, Wine Traders, John Lewis, Old Wellingtonians and Civil Service, all of which have been able to experience the “eccentricity” of playing on The Claridge Courts. Sadly, in 2016, a decision was taken to renovate the interior of the RAF Club in response to increasing demand for additional accommodation. One of the consequences of the decision was the removal of The Claridge Courts, marking the demise of two of the oldest squash courts in the world. One of those campaigning to save the courts, Squadron Leader Philip Tilstone, a member for 30 years, said: “Whilst I understand the commercial reasons for the decision to close the courts I find it extremely disappointing that no other arrangements have been proposed. Thanks to the RAF Club, the Royal Air Force, Wikipedia, The Times, West End Extra and The London Evening Standard. Dating from 1927, the oldest private squash court in London has a remarkable history. Situated on the top floor of a mews building attached to No.4 St. James’s Square, the court was built by The Army and Navy Club which had outgrown its premises on the corner of Pall Mall and George Street. After 3 years of development the new mews building provided chambers, bed-sitting-rooms, bedrooms, a ladies’ drawing-room, a dining-room and ground floor shop premises in addition to the squash court. The Army and Navy Club had been founded in 1837, the year Queen Victoria acceded to the Throne. It had been formed to meet the needs of the many army officers wanting to join a Service Club, most of which were already full. 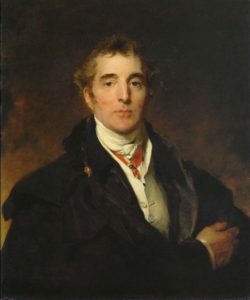 Its first president was Arthur Wellesley, First Duke of Wellington, who accepted the post on condition that membership was also open to officers of the Royal Navy and the Royal Marines. By 1862, London boasted three Service Clubs: the United Service Club, the Junior United Service Club and The Army and Navy Club, all of which were at full capacity. To meet demand, a fourth club, The Naval and Military Club, was founded in March 1862 by a party of officers who at that time were quartered at the Tower of London. After several changes of premises, The Naval and Military Club moved, in 1866, to 94 Piccadilly, also known as Cambridge House. There, it came to be known as “The In & Out” from the prominent signs on the building’s separate vehicle entrance and exit gates. 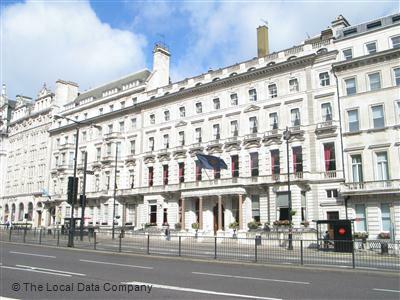 In 1996, having failed to agree terms for a new lease in Piccadilly, the club purchased the freehold of 4 St. James’s Square and finally moved into its new home on 1st February, 1999. 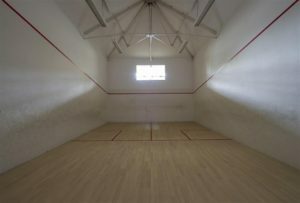 As part of its freehold, The In & Out gained access to the squash court formerly used by The Army and Navy Club. Now in its 90th year of use, access to the court is a key part of the club’s fitness and leisure programme. 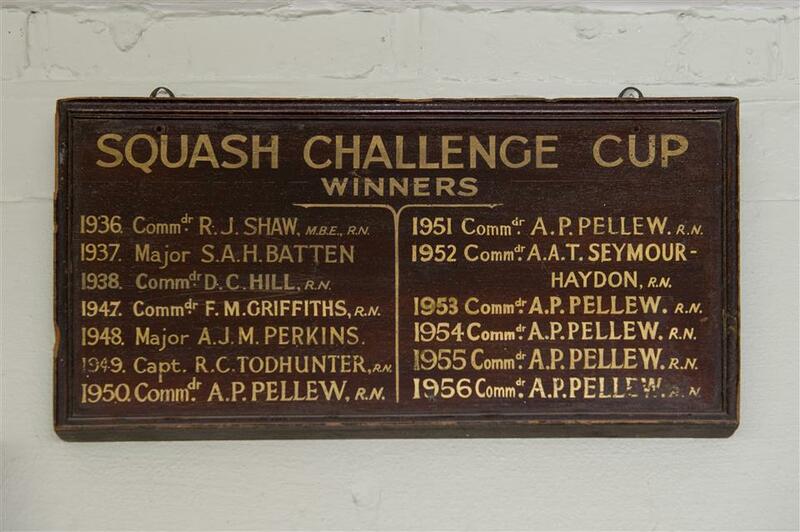 Evidence of the historical use of the court can be seen in the form of an honours board in the clubhouse where the winners of a Squash Challenge Cup for the years 1936-56 are listed. The competition was not contested for the years 1939-47. The Naval and Military Club is now advertised as a St James’s private members club for ladies and gentlemen, and officers of the Armed Forces. 4 St. James’s Square was built in 1726–28 during the reigns of George I and George II. Amongst its distinguished occupants were Waldorf and Nancy Astor who made it their London residence from 1912-42. American-born Nancy Astor was the first woman to sit as a United Kingdom Member of Parliament in 1919, later becoming Viscountess Astor. In 1942, the house was requisitioned by the government and was used as the London headquarters of the Free French Forces led by General Charles de Gaulle. In April 1984, St. James’s Square became the centre of world attention as the setting for the 11-day long Libyan Embassy siege triggered by the fatal shooting of WPC Yvonne Fletcher. 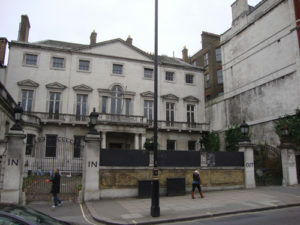 The Libyan Embassy occupied 5 St. James’s Square. The websites of The Army and Navy Club, The Naval and Military Club and British History Online. Thanks to Wikipedia as always. A short film that explores the abstract narrative of an enthusiastic and passionate “squash” player. There’s a lot to like about Goulet and Chauncey’s short film, not least the bewildering number and variety of ‘that’s not really squash‘ references, possibly referring to the ‘Ω’ of the fiilm’s title. There’s the actual squash reference, of course, namely the main character’s narrative tribute to his hero Jahangir Khan and his astonishing 555 match unbeaten run. But then the film introduces a series of images which, whilst not distracting from the story, kept this viewer at least wondering where the plot was heading. There’s Tommy’s training regime which shows him roller-blading whilst playing air-shots with a racquetball racquet. Crossed badminton racquets adorn the wall of his room above a photograph of Jahangir. When the on-court action begins, Tommy and his opponent, Jon, enter a giant glass-backed court with no wall markings or tin. The court’s floor bears several sets of markings, including (possibly) badminton, whilst an on-court umpire completes the surreal setting. Finally, having been knocked unconscious during his match, a dream sequence (Tommy’s sitting fully-clothed in a milk-filled bath being sponged down by the umpire and two assistants) is intercut with unsuccessful on-court attempts to resuscitate him. I, for one, can’t wait for the follow-up. It’s one thing to write a serious play, particularly one using squash as a metaphor for the male social games played out by the protagonists of a classic love triangle. 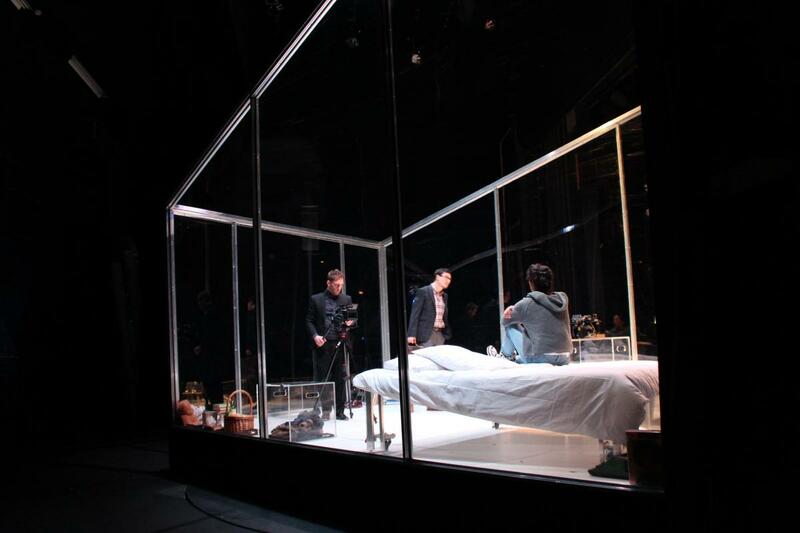 But it’s quite another to stage that play live on a set designed to replicate the closed space of a squash court. Nevertheless, at least two attempts have been made in recent times to do just that. The play, of course, is Harold Pinter’s 1978 masterpiece ‘Betrayal’ in which Emma betrays her husband, Robert, a publisher, by conducting a seven-year affair with his best friend, Jerry, a literary agent. 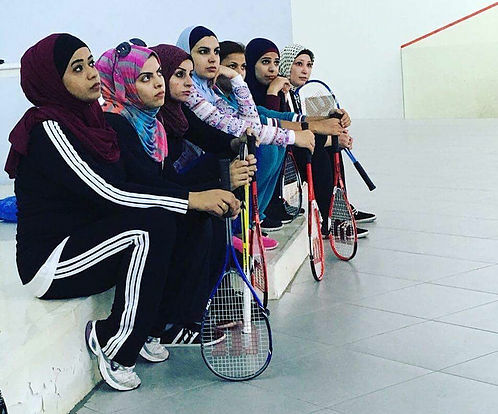 “… the entire play turns out to be set in a squash court. The glass fourth wall does gradually recede throughout the action, which, at least, has the effect of situating each scene in a different space, even if they are all white with a red line running round them about halfway up the wall. But even this hardly feels like an outrageous exercise in regietheater gone mad. Thanks to the Berlin Renaissance Theatre website and the ‘Postcards from the Gods’ blog for reviews of ‘Betrogen’. Thanks to The Guardian and the ‘Behind The Arras’ website for reviews of ‘Betrayal’. I have to admit that until recently I’d never heard of the Colombian city of Floridablanca. True, thirty years ago I probably flew over it en route to a memorable stay in the Colombian capital of Bogota. but, at the time, my attention was focussed on reaching Lima where I was due to join a group destined for Andean adventure, Amazonian exploration and, although I didn’t yet know it, severe food poisoning. Nevertheless, at 928 metres above sea level, Floridablanca had, and presumably still has, something that, at 2640 metres, Bogota noticeably lacked; namely, enough air to breathe whilst playing squash. In March this year, Floridablanca hosted the inaugural Ciudad de Floridablanca PSA Women’s World Tour tournament, the final rounds of which were played on an open air court located in the city’s Parque el Santisimo. In the final, former World Number 1 Nicole David defeated America’s Olivia Blatchford 11-3 11-4 11-8. All this might not sound particularly special but the location of the court certainly was, sharing an elevated plaza with the tallest “Christ the Redeemer” statue in South America. At 43 metres, the Floridablanca statue dwarfs its 30 metres tall rival in Rio de Janeiro which, as I recently discovered first-hand, shares its vantage point on top of Corcovado mountain with up to 14,000 visitors a day most of whom spend their time getting in each others’ way and taking photographs of themselves and each other with smart-phones. The Floridablanca venue joins other iconic squash court locations, including the Great Pyramid of Giza in Cairo, the Vanderbilt Hall at Grand Central Terminal in New York and The Peninsula in Shanghai, in providing an providing an incredible setting for some of the best on-court action. So the next time you consider visiting Rio for the holiday of a life-time, why not check out ticket availability for the next Ciudad de Floridablanca? You could even fly down to the fascinating city of Bogota for a few days. But if you do decide to visit Floridablanca, be sure to pack your umbrella. And if you decide to check out the capital too, you might want to consider an oxygen tank. Thanks to Squash Site for its review of the inaugural final and to My Rio Travel Guide for its information on visitors to Rio’s “Christ the Redeemer” statue. Thanks also to Colombia Reports for its article on Floridablanca’s “Christ the Redeemer” statue. A couple serves up tragedy on the squash court when someone doesn’t abide by club policy.